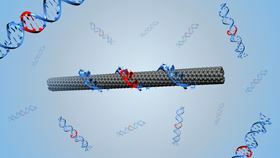 An illustration of a DNA-wrapped single-walled carbon nanotube. Image: Benjamin Lambert, EPFL. Directed evolution involves mutating a protein to create a collection of mutant protein variants, and then selecting those variants that show improved or more desirable functions. These selected proteins are then once more mutated to create another collection of protein variants for another round of selection. This cycle is repeated until a final, mutated protein is evolved with optimized performance compared to the original protein. Now, scientists from the lab of Ardemis Boghossian at the Ecole Polytechnique Fédérale de Lausanne (EPFL) in Switzerland have been able to use directed evolution to build not proteins, but synthetic nanoparticles. These nanoparticles are designed to be used as optical biosensors – tiny devices that use light to detect biological molecules in air, water or blood. Optical biosensors are widely used in biological research, drug development and medical diagnostics, such as real-time monitoring of insulin and glucose in diabetics. As reported in a paper in Chemical Communications, her group used directed evolution to modify the optoelectronic properties of DNA-wrapped single-walled carbon nanotubes (DNA-SWCNTs), which are nano-sized tubes of carbon atoms that resemble rolled up sheets of graphene covered by DNA. When they detect their target, the DNA-SWCNTs emit an optical signal that can penetrate through complex biological fluids like blood or urine. The group start with a DNA-SWCNT complex with a dim optical signal. They randomly mutate the DNA sequence and wrap the mutants around SWCNTs to produce new DNA-SWCNT complexes. Then they measure the optical signal of these new complexes and select those exhibiting an improved optical signal. After several cycles of evolution, this produces DNA-SWCNT complexes with enhanced optical behavior. Using this directed evolution approach, Boghossian's team was able to engineer new DNA-SWCNTs with optical signals that are enhanced by up to 56% – and they did it over only two evolution cycles. "The majority of researchers in this field just screen large libraries of different materials in hopes of finding one with the properties they are looking for," says Boghossian. "In optical nanosensors, we try to improve properties like selectivity, brightness and sensitivity. By applying directed evolution, we provide researchers with a guided approach to engineering these nanosensors." The study shows that what is essentially a bioengineering technique can be used to more rationally tune the optoelectronic properties of certain nanomaterials. "Fields like materials science and physics are mostly preoccupied with defining material structure-function relationships, making materials that lack this information difficult to engineer," explains Boghossian. "But this is a problem that nature solved billions of years ago – and in recent decades biologists have tackled it as well. I think our study shows that as materials scientists and physicists, we can still learn a few pragmatic lessons from biologists."